40-Love? I don't love nobody! Discover a new level of play with dynamic restringing tension down to 1/10 of a pound. Dynamic stringing offers players a bigger sweet spot, optimizing their game. 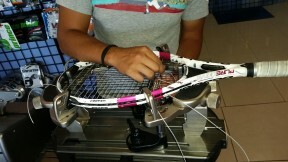 Whether you need more power or control we customize your racquet tension and type of strings. A tennis racquet should be restrung every two to three months depending how much a person is hitting per week. Whether the string is a multifilament or a polylon, strings should be restrung at a certain time. After a racquet is strung it loses tension from hitting and its elasticity naturally over time. We also offer stringing reminders through email. Let our staff know if you are interested, and we'll get you set up. Drop off your racquet at our westside location today! The Stringing labor only costs $15.00. You can bring your own string or choose from our wide variety. Racquets are typically ready the same day. However, if you need your racquet in a hurry, please call ahead so we can have a stringer available. Also, there is a $5 rush fee for guaranteed same day stringing. A Free Can of Balls!